Bradley L. Garrett is a social geographer at the University of Southampton currently working on the politics of public space. 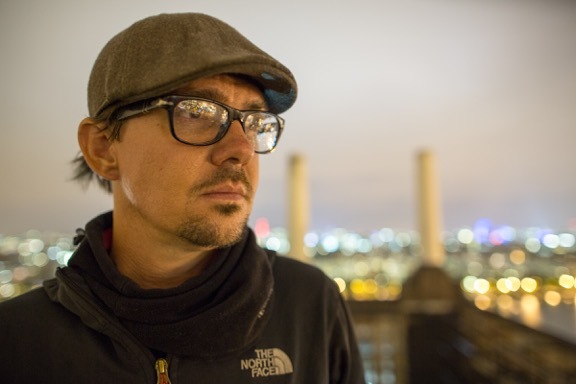 After a brief career as an archaeologist working for the United States Bureau of Land Management, he moved to London, England, in 2008 to undertake a multi-year ethnography with urban explorers interested in forgotten and off-limits places in cities. His first monograph, Explore Everything: Place-Hacking the City (Verso), is an account of his adventures trespassing into ruins, tunnels and skyscrapers in eight different countries. In 2014, he published Subterranean London: Cracking the Capital (Prestel Publishing), a photographic dissection of what lies underneath the streets of London, layer by layer. 2016 marks the release of the final book in his urban exploration triptych: London Rising: Illicit Photos from the City’s Heights (Prestel Publishing), which documents the social, infrastructural and corporate verticalities of the city. He currently writes a column for Guardian Cities (UK) on global public and private space issues and his research has been featured on media outlets worldwide including the BBC (UK), ABC (Australia), and Time Magazine (USA). He was the recipient of the 2015 Outstanding Early Career Alumni award from James Cook University in Queensland, Australia. London Rising: Illicit Photos from the City’s Heights (2016). Explore Everything: Place-Hacking the City (2014). Subterranean London: Cracking the Capital (2014).